I must confess, I almost never have time to read the newspaper anymore but if I make the effort, it’s usually on the day the food section comes out. 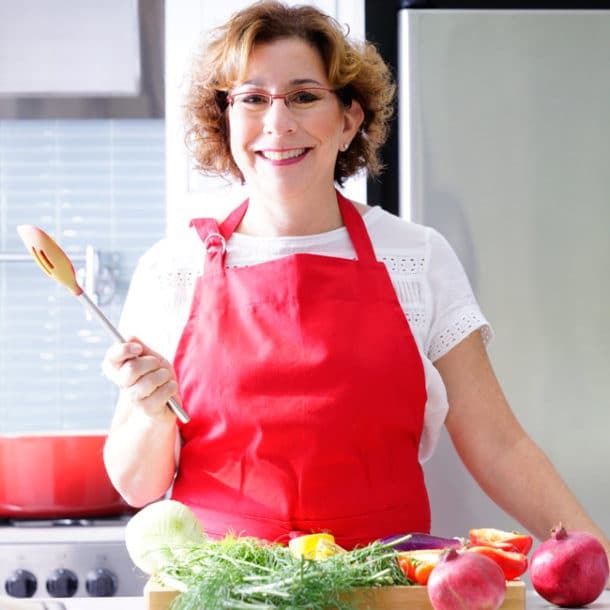 This strategy paid off for me last year when the San Jose Mercury News reprinted a wonderful recipe from Melissa Clark, food writer for the New York Times and cookbook author (In the Kitchen with a Good Appetite). The recipe was for a Vegetable Wellington – a variation of a popular beef dish but clearly without the main star satisfying only the carnivores on your guest list. I was intrigued as I was preparing a menu for Thanksgiving at the time and one of our guests would be a vegetarian. My goal was to find a dish that could be prepared ahead of time and would taste hearty enough to count as a suitable substitute for the turkey protein the rest of us would be enjoying. This recipe absolutely hit the spot. 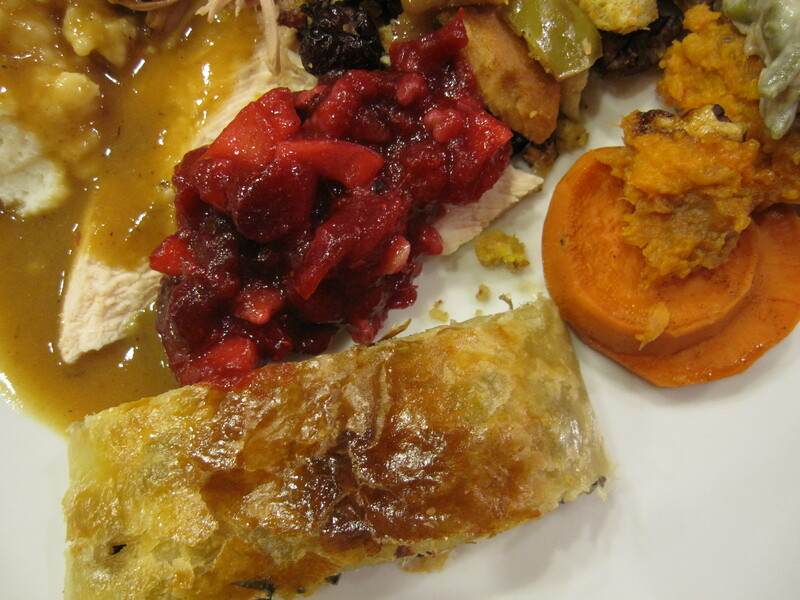 Everyone enjoyed it, perhaps more than the turkey, and it returned to our menu this year by request of all guests. 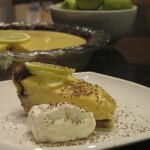 So I wrote to Ms. Clark to ask if I could write about the recipe and she obliged happily. Ms. Clark was inspired to create this dish as the fall days came and the idea of puffy, flaky pastry was swimming in her head. As functional and toasty as the puff pastry is as a blanket for the filling, it’s the ingredients it envelopes that really steal the show. 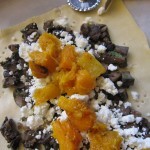 The filling is simple — butternut squash with a hint of thyme and maple syrup, mushrooms sautéed with white wine, garlic, and shallots, and creamy, crumbled goat cheese. 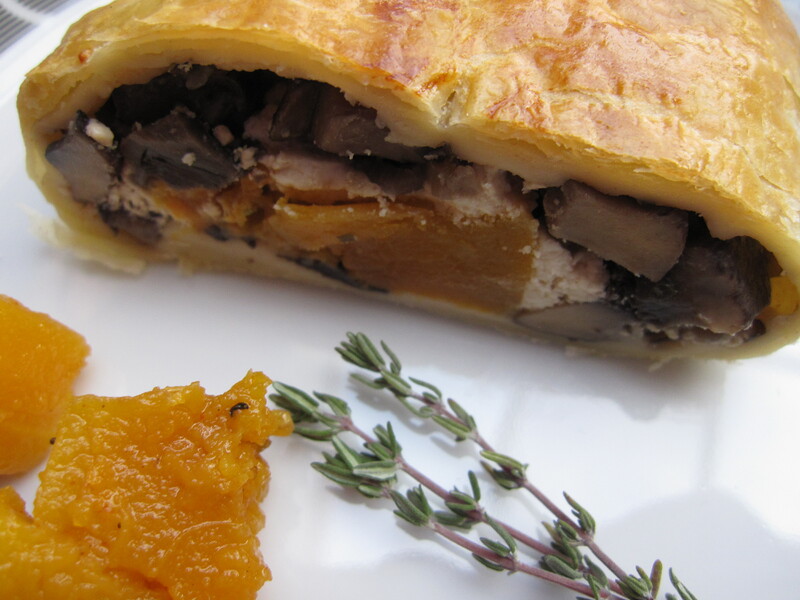 The combination of sweet squash, savory, pungent mushrooms, married together with melted goat cheese and swaddled in flaky puff pastry is nothing short of divine. 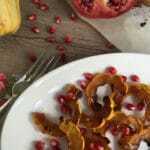 If you are a vegetarian, are serving vegetarians, or just like to go meatless on occasion, add this recipe to your repertoire and consider it as you prepare your upcoming holiday meal menus. 1 egg whisked with 1/2 teaspoon water. If you'll be preparing these immediately, heat the oven to 400 degrees and line a large baking sheet with parchment. Alternatively, you can roast it at 400 degrees in the oven with some olive oil, salt, and pepper - it will take about 20 minutes. You can stir in the syrup, thyme, and paprika when you take it out of the oven. I did this the day before and stored it in a container in the refrigerator. Turn the heat down to medium and melt the remaining butter in the skillet. Stir in garlic and shallot; cook 1 to 2 minutes. Add the mushrooms and remaining salt. Cook until mushrooms are soft and their juices evaporate, about 10 minutes. Stir in the wine and cook until the mixture is dry, about 5 minutes. Stir in the pepper and parsley. Taste and add more salt if needed. You can also do this the day before, if you like. On a lightly floured surface, unwrap the puff pastry. Cut into two 5-by-15-inch rectangles. (I did not cut the puff pastry - I folded the wellingtons into a wider form than she suggests but that's really up to each chef and how you want to present it on your plate. It worked well as a larger piece for me.) Spread mushrooms on each pastry rectangle leaving 1/4-inch border. Spoon the cheese crumbles over the mushrooms. Then spoon the squash over the cheese, leaving a 1 1/2-inch border (it will look like a stripe of squash lying on a bed of cheese and mushrooms). Brush the exposed borders of dough on each rectangle with the egg wash. Fold the long sides up to meet in the middle and pinch together to seal; pinch the ends, too. Transfer the pastries to the baking sheet (I used a spatula to help since my form was larger) and turn them over so that the seam is face down. If you end up with any small holes in the puff pastry, just close them up with your hands. There isn't any liquid, so a tiny hole won't destroy the wellington.) Brush the tops with more egg wash. Bake until they are puffed golden, and firm to the touch, about 30 minutes. * Let cool for 10 minutes, slice and serve. * I wrote to Ms. Clark to ask her if the puff pastry would be ok if you prepared these early in the day, refrigerated, and just applied the egg wash last minute and baked them. She said it would be fine, but to expect a few minutes extra baking time if they were cold from the refrigerator. I used this method and it worked perfectly! 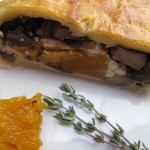 Ooooh, I love the combo of mushroom and puff pastry in this dish! Mushrooms add such tasty umami flavor to anything; I don’t even miss the meat when I eat something like this. You really don’t – it has so much flavor! This looks amazing! 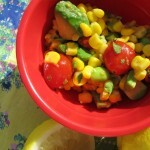 Im always on the lookout for good vegetarian recipes! I will be adding this to my next gathering! 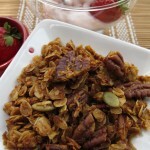 This is so delicious it will even make your carnivores into vegetarian main dish lovers! What a genius twist for beef wellington! Absolutely perfect for the holidays, but I’m thinking more along the lines of dinner tonight 😉 Thanks for the great recipe! And so seasonal w the butternut squash! This is such an awesome recipe for when you are entertaining. Like you say perfect for Thanksgiving, but also great when you have friends coming over on a Saturday. I love most anything wrapped in a pasty! This looks sooo good! This really is delicious – when I’ve served it at Thanksgiving, even the carnivores like it as much, or more, than the turkey. Wow! That is beautiful. I am a vegetarian and my husband is allergic to turkey, so this rocks. He makes his grandmother’s strudel–stretching the dough until it is translucent–I bet it would be good with this filling. It was indeed delicious when we had it this Thanksgiving. Next time you make it can you make extra one for me? Yes, I will, I promise! YAY!!!! 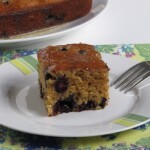 Thank you so much for the recipe, Beth! It looks fantastic and I will definitely try it out. I can’t wait! BTW, I made your Pork Carnitas this past weekend for a holiday party for a bunch of carnivores and they all said they loved it! Thanks so much for that recipe! You’re welcome Brenda! You know, Brenda’s breaded chicken is still one of my most popular posts! 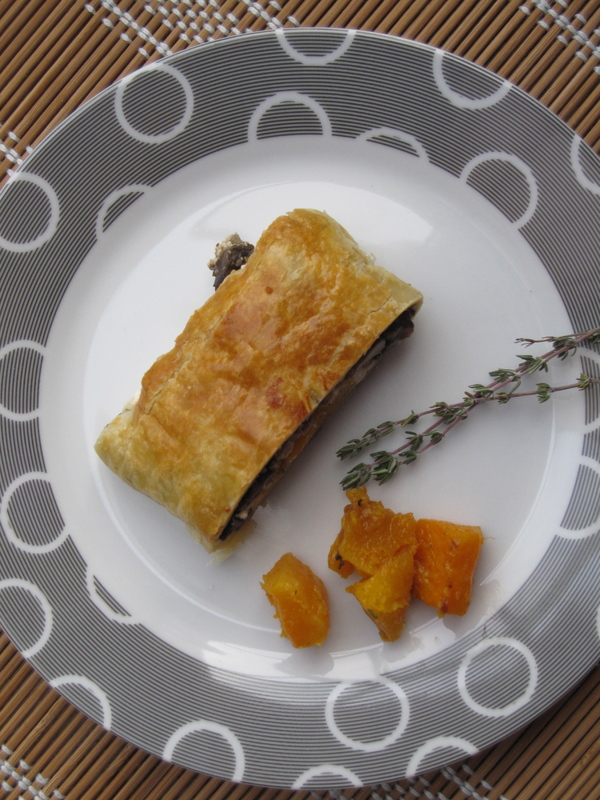 Let me know if you make this vegetable wellington and what you think of it.